The UAB/Lakeshore Research Collaborative is a research partnership between Lakeshore Foundation and the University of Alabama at Birmingham (UAB). 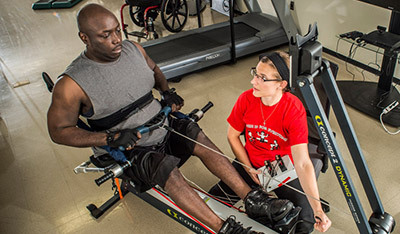 Ultimately, the Collaborative seeks to improve the quality of life of individuals with physical disabilities through comprehensive rehabilitation and sport science research. This research focuses on the development and evaluation of new programmatic, policy, and service efforts, the development and validation of new supportive technologies, and the identification and advancement of meaningful alternatives for people with a physical disability or chronic health condition. The Collaborative involves faculty, staff and students from various UAB departments; staff and members from Lakeshore; as well as community organizations. The Collaborative’s Exercise and Sport Science Research Lab and research team offices are located on the first floor of Lakeshore Foundation’s main building, just past the Fitness Center. Click here to read about the first five years of the UAB/Lakeshore Research Collaborative. This report highlights some of the most significant achievements resulting from successful partnerships with key collaborators from academia to the business community. You will also read about the core values that have shaped the work of the Collaborative. Currently there are 20 ongoing projects that are supported by $7M in annual federal funding. 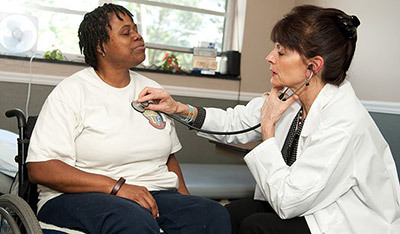 The collaborative funding sources include National Institute on Disability, Independent Living, and Rehabilitation Research (NIDILRR), National Institutes of Health (NIH), U.S. Department of Defense (DOD), Centers for Disease Control and Prevention (CDC) and the University of Alabama at Birmingham. we are currently recruiting for. The Exercise and Sport Science Laboratory houses a variety of equipment dedicated to comprehensive health promotion and sport science research. Lakeshore Foundation’s research staff works closely with various partners including a group of research associates who serve as a resource in their particular areas of expertise. Together, the staff and associates comprising this multi-disciplinary research team, have conducted numerous research projects, published peer-reviewed journal articles, and presented at national and international conferences. WD has his workout routine down to a science. Learn how he used a research study to achieve his fitness goals.